Times of India : Former Anna University vice-chancellor P Mannar Jawahar, who has been teaching at the Madras Institute of Technology after his tenure ended in 2012, was placed under suspension on Tuesday, two days before he was due to retire from service. Sources said the action follows an investigation started by the directorate of vigilance and anti-corruption (DVAC) into allegations of corruption during his term as VC. Jawahar, who found the orders waiting for him at home on Tuesday, said he was puzzled by the sudden turn of events. "I am unable to understand why this action has been taken," he told TOI. "Only last week my colleagues gave me a farewell party. Even the (current) vice-chancellor was there. Nobody mentioned anything to me. I have been going to work regularly, and don't know why this is happening," Jawahar told TOI. "An inquiry into grave charges against P Mannar Jawahar is contemplated. Hence, he is suspended from service," the letter of suspension from the university's registrar-in-charge S Ganesan said. Sources said DVAC started inquiries based on a complaint filed by the university a few days ago. "We will conduct a detailed inquiry on the complaint, and action will be initiated based on the outcome," a DVAC officer said. Last year, some faculty members of the university, who had been suspended, claimed that during his tenure as VC, Jawahar had asked them to award higher marks to some students in a revaluation exercise. He has, however, denied any involvement in the scandal. Jawahar served as vice-chancellor of one of the country's largest technical universities from June 2008 to 2012. He was given a year's extension as VC by the then governor Surjit Singh Barnala after his tenure ended in 2011. Since June 2012, when his term as VC ended, Jawahar has been working as a professor in the department of automobile engineering at MIT in Chromepet. He has been teaching BTech and ME students there. 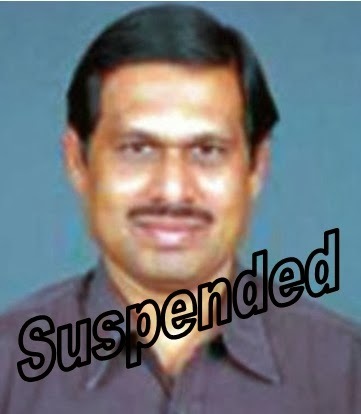 Former Anna university vice-chancellor Prof P. Mannar Jawahar, serving as professor in the university’s Centre for University Industry Collaboration (CUIC), was suspended on Tuesday night. His suspension came at a time when he was to retire from service on Thursday. University sources alle­ged that he had been suspended as a few cases, including illegal admission of students in Anna University’s College of Engineering, Guindy, and alleged purchase of computer equipments for university departments, are pending against him. The university sources also said Prof Jawahar during his tenure as vice-chancellor had appointed his wife Jewelcy Jawahar as international affairs advisor. A senior university official said the state government’s directorate of vigilance and anti corruption (DVAC) had registered cases against a few of the university officials for their alleged role in the irregularities. “Based on these we decided to place Prof Mannar Jawahar under suspension until the inquiry is completed,” the official said. When contacted over the issue, Professor Mannar Jawahar confirmed that he had rec­eived the brief suspension order on Tuesday night. “I am innocent and I had been true to myself and others. I am clueless as to why I was suspended when I have only a day to serve the university. I will prove my innocence when asked to, I have nothing more to say,” he told DC.